LC Lauren Conrad Pointelle Sweater – I bought the Doeskin and the Marsala colors. I love sweaters and I love the sweetheart mock neckline. LC Lauren Conrad Pleated Chiffon Skirt – I purchased it in the color Cafe Tint. The skirt is a bit tight even at my usual size 6. The skirt is made to sit on your waist. It is beautiful and flowy. My daughter loved it. She kept lifting the skirt up and feeling the chiffon. 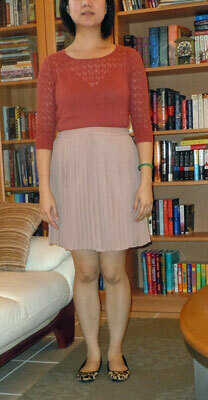 I rather have gotten the Cream colored Pointelle Sweater (like the one Lauren wears) to match better with the skirt. But it is unavailable right now. The sweater is really nice and thin. Very delicate and the thread can easily come apart. I never worn stockings with shorts before but it’s doable. I got the shorts in a size 6. It fits alot better than the skirt did. I do like how this outfit turned out. Very causal but with heels, it looks a lot more glamorous like an outfit for the clubs. Though after standing in heels for the entire day, my feet hurts now. Do you like the outfits? Which do you prefer?